EEEEEEEEEEEK! Now this is something delicious to end your Thursday night with a smile on your face!! NOIRELAND International Crime Festival is delighted to announce a sensational new addition to this year’s programme. The internationally celebrated Irish actor Aidan Gillen will be appearing in a special event on Saturday 28 October * entitled ‘Playing in the Dark: Aidan Gillen talks Crime with Brian McGilloway’. Aidan Gillen will be discussing the influence of crime fiction on his life and career, from the books and television shows Gillen enjoyed growing up to the award winning roles he has become renowned for. 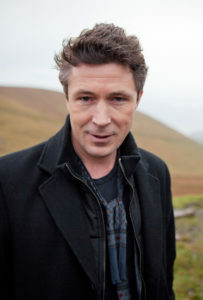 Aidan Gillen has earned an international reputation as one of Ireland’s finest actors. Best known for playing manipulative and scheming characters (including Petyr Baelish in HBO’s Game of Thrones), his performances resonate with subtlety, intelligence and depth, and won him a host of acting awards. Gillen, who will be appearing in the new series of the BBC’s Peaky Blinders, has starred in some of the most iconic and influential crime dramas produced in recent years, including the multi-award winning The Wire and RTÉ’s Love/Hate. Brian McGilloway is the New York Times bestselling author of the critically acclaimed Inspector Benedict Devlin and DS Lucy Black series. In 2014, Brian won BBC NI’s Tony Doyle Award for his screenplay, Little Emperors. He currently has a number of screen projects in development with BBC NI. NOIRELAND International Crime Festival is a celebration of Ireland’s love of crime fiction. We have the best in local talent, guest appearances by acclaimed novelists, and in-depth conversations with some of the greatest actors and screenwriters to put crime dramas on the screen. Guests include Jed Mercurio and Adrian Dunbar from Line of Duty; international bestseller and Hollywood scriptwriter Robert Crais; John Banville writing crime fiction as Benjamin Black; Booker nominated Graeme Macrae Burnet; international bestseller and creator of the Intercrime series Arne Dahl; multi-award winning Irish crime writer Adrian McKinty and bestselling thriller writer Sophie Hannah. This entry was posted in Coming Soon, Events, Home and tagged #Crime #Twists #Murder, #CrimeFiction, #Festivals by crimebookjunkie. Bookmark the permalink.